Although the Dr. Who DS case is a little over the top for my tastes, the sonic screwdriver stylus would be a whole lot of fun. 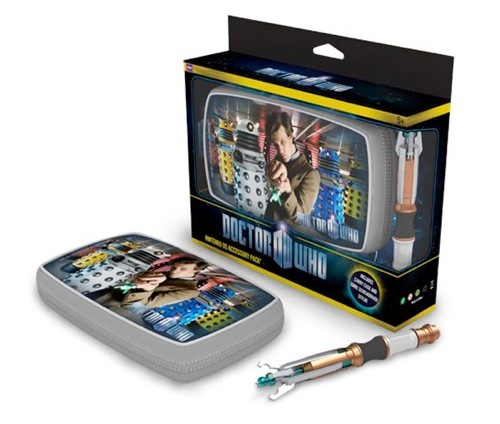 This full kit will be plenty to fill your Dr. Who obsession. Of course it’s not like you actually get to pick which Dr. to be featured on the case, but at least the general theme is right. These will fit the regularly sized DS units and give your DS that sci-fi touch that it truly needs. These will be shipped out October 29th, but you can go ahead and pre-order it now. They’re up for grabs on Amazon UK, but it doesn’t look like this is making it to the US just yet. To order it it’ll cost you £14.99 or about $24.